I recently purchased 2 manzanita branches and some large rocks that I'd like to use in my new tank. Although they still need to be cleaned and treated before they can be used, I was hoping to get some advice. For those of you attending the potluck tonight, may I ask for your input as to how I should arrange them? I am second-guessing my placements and would feel much better getting opinions from more experienced members. Always remember, YOU have to look at this all the time. NO ONE else has to see it except when you share photos. Thanks for the reminder I know that it's all subjective and that it is ultimately my decision how this will turn out. But, being new to the hobby, all I've had to reference are the photos and videos I've seen online - most of which are professionally created. I am hoping to get some design ideas as well as practical advice and tips/tricks for arranging the tank that will allow a newbie like me to maintain it relatively easily. Were you the one asking about fish to put with exclamation rasbora? Yes, I was asking for suggestions on other schooling fishes but for the chili rasboras. I initially thought they would do well with the Vietnamese White Clouds but it seems they would not be compatible. Microdevario kubotai is the other fish I mentioned. The one I couldn't remember . Where'd you get your Vietnamese white clouds? I have a group with too many males and am looking to trade some males for some females (or at least get some more females). Sorry for the confusion as I currently don't have any. I was getting advice on what schooling fishes to keep together with the rasboras. Show us some pictures of your hardscape and how you are planning to place it in the tank. Due to the overabundance of plants I bought at the auction last night, I decided to ramp up my plans for completing the tank. I stayed up past 2 AM last night to comb through every plant and remove all of the hitchhikers (i.e., duckweed, baby snails, etc. ), emptied the tank to put in the new soil I bought and got every plant in the water. Had to deal with flow issues as my canister filter was causing all of the plants to uproot and the floaters to swirl like crazy. I watched some videos of people removing bark from manzanita branches and was planning to do that but I also found some videos of people keeping the bark on and they weren't bothered by it so I will give it a try on mine (my tap water could use some softening). Took over my kids' bathtub and soaked the branches and rocks in boiling water overnight. I am now doing a 20% water change, cleaning the filter and adding in the large rocks. The branches will have to wait until they are completely waterlogged. Taking a break and will (hopefully) finish everything but the branches tonight. Will update afterwards. Bongox3: Thanks for the suggestion (that rainbowfish is beautiful! ), but I've already done the deed and made my fish order. I am excited to see all of this come to fruition. Forgot to add my 3rd grade sketch of what I envision. Since my current group of fishes love the natural cave so much, I'm going to replicate it, but on a larger scale, using the manzanita branch on the left side. I haven't decided where I'm going to put all of the plants at but at least I'll have a better idea once the hardscape is in. It's not exactly what I wanted initially but I'm beginning to find out that most of what I want requires a high-tech set up which I'm not ready to try yet. Hi everyone Just wanted to give a little update to my tank and give credit to those of you who helped me with advice/ideas. Thank you! It's been just over a month since I attended my first SCAPE meeting in December. I snagged a ton of plants even though my tank and hardscapes weren't ready yet. 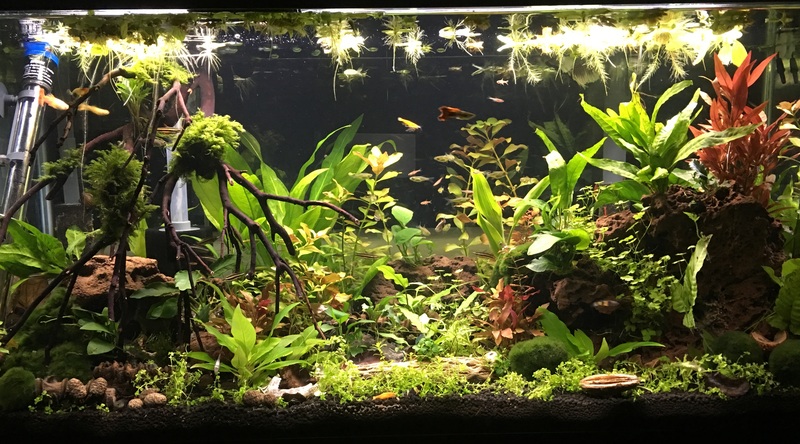 And although the layout and design didn't turn out the way I envisioned, I am happy with the end result and my fishes/inverts are (thankfully) thriving. It looks really lush! As the plants settle in and grow, you'll have a better idea of how you want to use them and can move them around to bring your vision to life.